Only one hour drive from the Melbourne CBD, in beautiful beach side Mount Martha, this bright,modern beach side retreat will inspire you. From the pretty bay and city skyline view, to the magnificent, sun drenched entertaining deck - it is made for serious relaxing! Offering comfort, style and some privacy too, there is nothing more to want except for great food and company to enjoy the beautiful surrounds. Facilities include: 2 Queen Beds, 1 x Double bottom and Single Top Bunk, a Single bed and Port-A-Cot. Linen available at extra cost. Central Heating and Air-conditioned dining and living area and Master bedroom, Telephone (local calls only), TV, CD/Radio/Stereo DVD, Bath, Brand new Fully Equipped Kitchen with Microwave & Dishwasher, Brand new Laundry with Washing Machine and Clothes Dryer, BBQ , Outdoor Table Setting and Outdoor Shower. Minimum 2 night stay (Min. 1 week in summer months). Please scroll down to calendar below for accurate pricing and availability. This newly renovated Modern 3 bedroom beach house is set on 12,000 square feet of land overlooking a nature reserve, then across the bay towards the city. It also features 2 bathrooms, comfortable and inviting living area with large balcony with bay views. It also has a great Outdoor Shower with Hot and Cold water for that wonderful experience of bathing outdoors! There is a large, fully-fenced yard with plenty of space to run and play or enjoy a game of cricket. The large master bedroom has a queen-size bed, plenty of wardrobe space and an en-suite. The second bedroom also has a queen bed, built in robes and also has access to adjoining brand new en-suite. The third bedroom has double bottom bunk and single top bed, another full-size single bed and robes. A port-a-cot can be provided at no additional cost. There is a brand new separate laundry with washing machine and clothes dryer and drying cupboard. Brand new marble kitchen is fully equipped with stainless steel appliances including oven,cook-top, microwave and dishwasher and butlers pantry. The dining and living area is comfortable and cosy with plenty of seating for the entire family which includes a flat screen TV. It looks out over a sun drenched entertaining deck, a nature reserve and then across the bay towards Melbourne to the MCG lights at night. It has plenty of seating to enjoy outdoor entertaining with an 8-seater dining table and BBQ. The deck also features a day bed area for total relaxation. There is a large yard with plenty of space for kids to run and play, enjoy a game of cricket or kick a football around and offers plenty of parking. Enjoy a 25 minute walk to South Beach and shops through the reserves walking track or a short 10 minute drive to Mornington's Marina and great variety of cafes, restaurants and shops. Enjoy the local craft markets of Red Hill and Mornington that provide fresh local products and hand made goods. There is a multitude of wineries and eateries at your doorstep and its only a 40 minute drive to Portsea and Sorrento. Relocation short term bookings also available at discounted rates. Thank you very much for allowing us to stay at 'Lanikai' last weekend. We all had a wonderful break at what is a great location. Hoping everything was in order after our stay,which was very relaxing. Thank you for allowing us to have such a peaceful stay at your beautiful 'Lanikai' beach house. We had so much fun exploring the lovely walking tracks and riding through the beautiful Nature reserve across the road both on foot and on our bikes. We will definitely be back! A Fantastic start to 2008! The environment 'Lanikai' is truly peaceful and relaxing. Thank you immensely for a memorable holiday. Definitely a five star stay! We had a great time here. Ben enjoyed the garden and both Decks. A beautiful and peaceful place we will keep in memory. Thank you! It's a beautiful house to stay for the weekends. We had the most enjoyable time. The decorations were superb,the rooms were very clean and the beds were nice to sleep on. Thankyou for making our holiday this wonderful. Meera & Julian - 3rd stay!!! This is our 3rd stay here in 2 years. Yes we love it! Looked at other places on the net since our 1st stay but still come back here 'cos it's the best for a 3 generation family holiday. Love the renovation of the en suite-very chic! Lower deck looks superb and will use it in our next summer trip (rained this visit). But rain or drought, summer or winter, it's always a relaxing and enjoyable stay. Have recommended to many friends. Already looking forward to our next trip! Have enjoyed a wonderful weekend here with the family.Weather has been so lovely. The view from the balcony is magnificent,and it has been so relaxing for us all. Your house is beautiful and has everything you need for enjoying yourselves! A Lovely time was had with our family. The house has a warm feeling of Aloha. Thank-you for the use of your home and we will be back again in '08'. A very comfortable house with beautiful views of the bay. It is very well maintained and has everything you need for a comfortable stay. Loved our stay in this gorgeous house! We had the most wonderful weekend at Lanikai. It was an absolute pleasure lounging about the house - everything has been beautifully styled and we felt like we had a real holiday even though it was just 2 nights. We're already plotting to come back for a visit next summer!! Could not fault this beautiful property, lovely fit out and spectacular grounds. Close to shops, and a great big kitchen/living to entertain. We will defiantly be back!! I took guests from Bribane and Singapore for a weekend of wine tasting and of course sampling the local produce. The house ended up being one of the key highlights of our trip! It was so comfortable and inviting that we chose to stay in for dinner, light the fire and watch movies while enjoying the food and wine we'd gathered during the day. 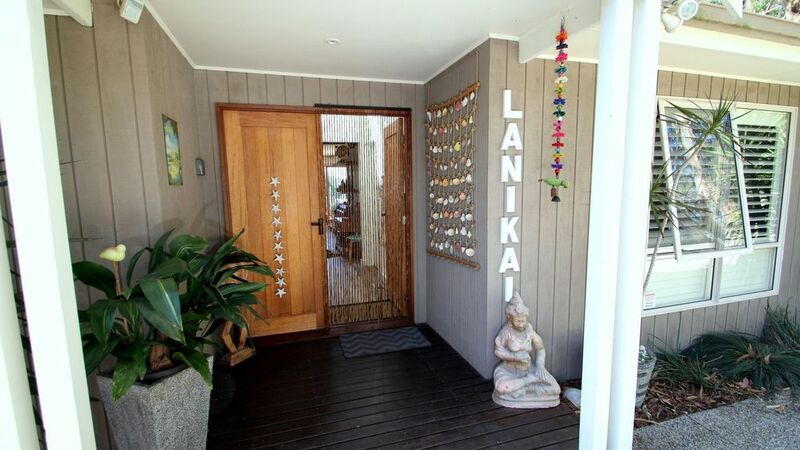 The house has been wonderfully styled with gorgeous Hawaiin memorabilia which all just seems to work. It has a very upmarket but homely beach house feel! Comfortable, practical, not to mention in a great location with the beach not too far away! Thanks Tas! I'll definitely be back.